At 9 p.m. on 18 October 1931, on the anniversary of his (claim) of the invention of the light bulb, the long life of America’s greatest ‘inventor’, Thomas Edison, came to an end. Thomas Alva Edison, hailed as ‘the greatest practical genius America has ever produced’, was born on Thursday 11 February 1847 in Milan, Ohio. Edison’s first invention was an electric vote-recording machine that was immediately rejected by the Massachusetts Legislature, probably because it restricted politicians’ ability to rig the vote. Later creations include the first commercially viable mimeograph, the dictaphone and the electric storage battery, as well as the first successful system for generating and distributing electricity. But Edison’s greatest fame came from three ‘inventions’ that he claimed that he invented. The phonograph in 1877, the incandescent electric light bulb in 1879 (although as we’ve pointed out it was actually invented by Joseph Wilson Swan in 1878) and early in the next century the ‘kinetiscope’, which was used for the first silent film – although the film wasn’t projected; the viewer had to see it through a peephole. Edison claimed that ‘My principal business is giving commercial value to the brilliant – but misdirected – ideas of others.’ His light bulb is the perfect example of this remarkably honest statement. 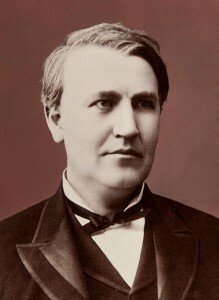 In fact, Thomas Edison not only did not invent the lightbulb, he did not invent many of the things attributed to him. His shrewd business skills enabled him to steal, improve, and patent many ideas before their original inventors were able to. He was, in addition, a ruthless man who attempted to discredit other inventors in order to gain popularity for his own. Maybe Edison’s real legacy is his hubris. Even today, in the age of the internet and instant access to information, people still believe many of his claims as the originator of many seminal inventions.